These cheese stuffed portobello mushrooms are delicious, versatile, and ridiculously quick and easy to make. Choose a melty cheese and make it as casual (as I did using marble cheese) or as fancy as you’d like. In terms of the toppings, you can use leftovers, vegetables and/or protein. 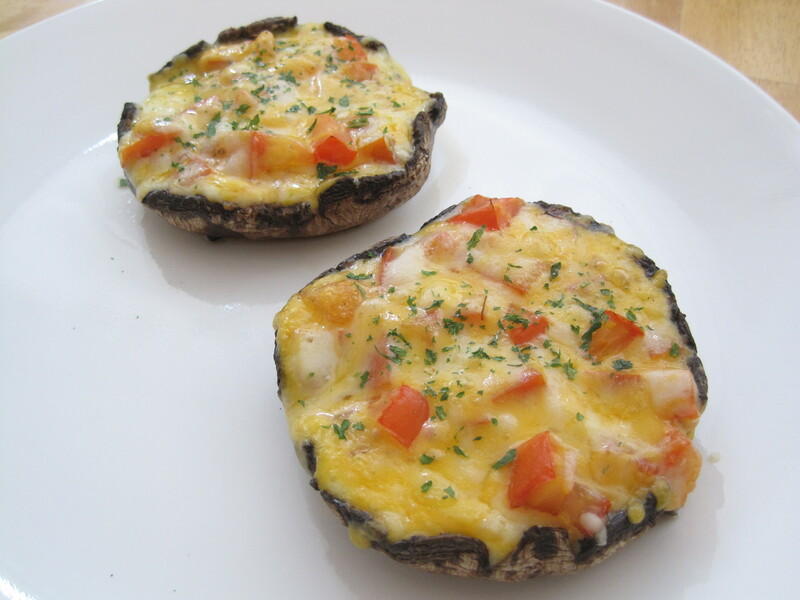 I had a tomato on hand and it added lovely acidity and freshness to the hearty mushroom and heavy cheese. Serve this as an appetizer, as a side, or as the main. Preheat the oven to 400 F. Place the mushrooms cap side down on a parchment paper lined baking sheet. Add your topping(s) of choice and then cover with shredded cheese. I like to add a few of the toppings to the top of the cheese as well. Bake until the cheese is bubbling and the mushroom is tender and heated through, about 2o minutes. Note that the cooking time will vary widely depending on the size of your mushrooms. Top with garnish (optional) and serve immediately.